I love wine myself and I always see great gifts for wine lovers like myself so I thought of putting together this Top 5 Best Gifts for Wine Drinkers list to share with you. There are the usual gifts you can get like the regular wine glasses or boring wine bottle openers, but what if I told you I can get you fun and unique items to give instead? Wouldn’t that make gift giving more fun? Make sure you bookmark this page so you can come back to it later if you need to review these five fun and unique wine gifts! Is this the coolest wine bottle opener or what?! Yes, it’s a gun shaped electric wine bottle opener that’s cordless and it also comes in pink for the ladies! You can easily open 30 bottles in one charge and this gun wine opener comes with everything you need: the charging base that looks like a holster, wall charger, and a foil cutter that stores neatly behind the charging base. You will be using the trigger to open your wine bottles. You will pull on the trigger to take the cork out of the bottle and the gun turns off when it’s done pulling out the cork. Because it’s an electric opener, you won’t have to be doing any of the pulling the cork out yourself, the gun will do it all for you. After it’s done, you just push the trigger forward to will reverse the corkscrew and the cork will come off the wine opener. You will be able to open a wine bottle in seconds and will be the talk of the wine party! This definitely makes one of the best gifts for wine drinkers who also loves guns! Customers rate this a high 4.6 stars out of 5 and 84% who reviewed this awesome gun wine opener gave it a 5 star. 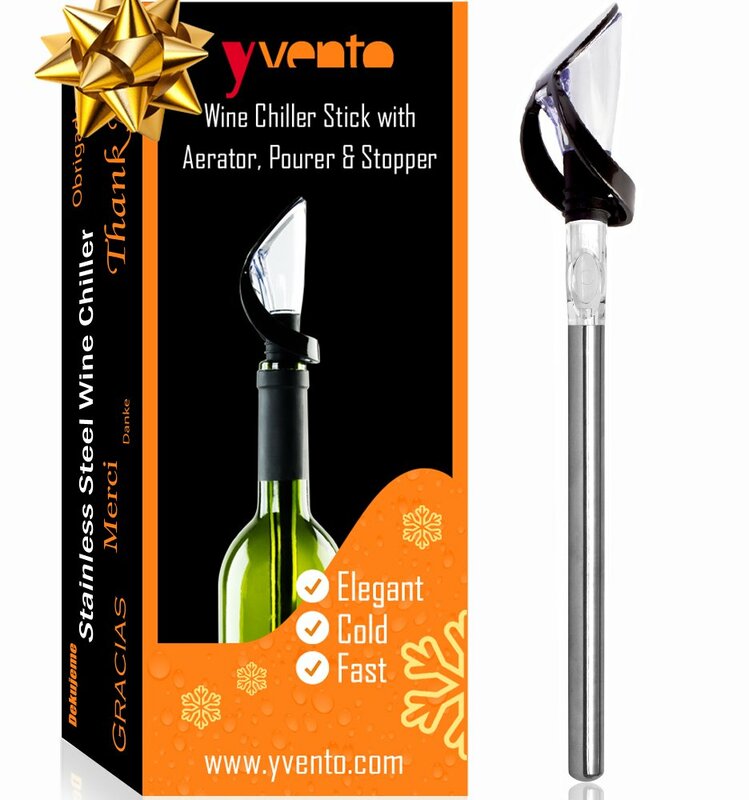 No more need for big, bulky wine chilling buckets, now any wine drinker can chill their wine easily with this Wine Chiller Stick that has 4 functions to it! The chilling stick can be removed from the pourer so you can just keep the chilling stick in the freezer when not in used. When your red wine is too hot or want to keep your chilled white wine cool while out of the refrigerator, just insert the wine chiller into the bottle and you’re all set. You or the wine drinker in your life will be able to drink your wine at the temperature you want at all times! The chilling stick will not chill a bottle of white wine, but it will keep it cool while out of the fridge for up to 2 hours or so while you’re enjoying your wine. This way, no need to for ice buckets or keep running to the fridge. Also, if you have a red bottle of wine that’s too hot for some reason, you can insert this chilling stick into the bottle and it will cool it down just right for you to drink. This great gift set is rated at 4.2 stars out of 5 and will make any wine drinker very happy to receive this! Here’s a really great way to display one’s wine bottles on the wall with this very chic and modern stainless wine rack by BGT. I love the simplicity of it and really like how it’s free hanging on the wall which showcases the bottles really nicely. The rack can hold 5 bottles but there’s also another option to only hold 3 bottles. The 3 bottle rack will be better to decorate your wall with because you can then put three of these racks side by side, thus having nine bottles of wine on your wall which looks very cool. You can do the same with the five bottle rack but that’s a lot of wine you’ll need to fill up all 15 slots but that would look like a wine cellar on your wall which is pretty impressive too! I think any wine drinker will love this type of wine storage to display their wines on their walls. You can be creative and stagger the multiple racks across your walls. Because you have 3 or 5 bottle racks, you can really create any kind of look you want on the wall. This would be a really neat idea to give someone or maybe I’ve given you ideas for your own place! Click below for more images to see how they are hung on the wall with the 3 or 5 bottle racks. You’ll also see that this modern wine rack is rated 4.3 stars out of 5 and customers really love this design that allows them to show off their wine collection! This awesome wine bottle glass will make a great funny gift for the wine drinker in your life and will be remembered for many years to come. On the back side of the wine glass, there is a Nutritional Value chart which has Fat, Sodium, and Total Carbohydrates at 0% but has “Total Happiness” at 100%, very fun and clever! This fun wine glass will hold an entire 750ml bottle of wine and you won’t need to get up for more refills. Rated at an impressive 4.6 stars out of 5 with over 1,200 customer reviews, this is a high quality product and has made many wine lovers very happy! Very often, people like to store a single bottle at a tilt and there are wine bottle holders just for this purpose and I have found an animal series like this Yellow Lab Wine Bottle Holder by Foster and Rye. Playful for sure, these bottle holders will be any room more fun and will make a great center piece for your dinner parties. Any animal lover will love these bottle holders as they also come in different animals like cows, bears, parrots, giraffes, and much more! The heavy base will keep the wine bottle safe and the felt on the bottom will keep your counters/tables protected. Easy to clean with a damp cloth, these animal wine bottle holders are great addition to any home decor without any mess. Best Funny Gifts for Wine Lovers: All Under $20! Best RC Drones with Cameras for Dads: Get Serious! Top 4 Best Shaving Kits for Men: Back To Classic! I hope this liked this list of the Best Gifts for Wine Drinkers! I have looked long and hard for these so you don’t have to do the searching yourself. I know it’s great to buy someone a gift that’s related to something they really like, so the wine products above will be a hit for sure for the wine drinker in your life! I have chosen these gifts based on uniqueness, fun factor, and how useful they are to someone who drinks wine, I hope you have enjoyed these. I know I will be getting the gun wine bottle opener for sure for my husband in the near future, with such high ratings, I know it will also work well too so you can’t go wrong if you want to buy it for someone special in your life too!